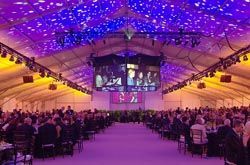 Advanced put together a hexagonal screen in the center over top of a circular stage for the Capital Campaign Launch for the University of Pennsylvania.Advanced Staging, out of West Chester, PA, has been creating shows for clients since its inception in 1985. After recently adding lighting in 2003 to its inventory, the company has seen astounding growth in the past few years, allowing it to venture into new areas of technology. Advanced got its start in 1985 doing basic AV rentals in audio and video, as current president Stephen Wildemann explained, "We started doing slide projectors, overheads, and monitor stands rentals. PC computer display was just coming on the market and we jumped on that bandwagon and became specialists in computer display back in the early days. That really meant something because it wasn't always easy to get a signal out of a computer, with all the various interfaces and compatibility issues as things grew. But that was our main thing, video and computer display. Then we gradually grew by doing bigger and bigger events." Wildemann joined the company in 1988, becoming president and a partner. Shortly after, the company branched out into the install business with Advanced Audiovisual Systems Integration. When the company decided to add lighting in 2003, its business dramatically improved, as Wildemann noted. "That really allowed us to take our final step into becoming full blown staging company. It got us into bigger events and it allowed us to offer all three disciplines, which most production companies liked because gave them just one point of contact. 2004 was a breakout year for us and we've been growing ever since." Adding lighting seemed to change the company's view of technology as well. "Adding lighting was a big thing and it changed the way we approached big jobs. We looked at them differently. From an audiovisual rental company standpoint, we piecemealed the jobs we couldn't provide for before, but when we brought in the lighting and more experienced stagers, we started looking at things on a bigger scale." Advanced even took this a step further by purchasing an Encore video system recently. Wildemann said, "We're probably not a big enough company to say we're going to be the first to try a new technology, so we usually wait for our clients to ask for gear a few times. The one exception was the Encore system. We hadn't done a single widescreen show, but the industry was moving in that direction and we felt we needed to take that step to position ourselves as a bigger staging company. Typically we go by cross rentals, a risk vs. reward kind of thing. But this was something that we could use to position us as a company that can do high end events, in comparison to the standard two or three screen shows." Advanced Staging recently did support for the Thomas Jefferson Foundation of the Thomas Jefferson University Hospital, providing lighting, video, and audio. In the near future, Advanced plans to bring digital audio to the mix, as Wildemann explained. "From an audio standpoint we're on the verge of buying our first digital board, which will definitely help us on our bigger events that have various entertainment elements involved. Being able to program EQ settings for all the acts is huge. That's a bit in the future, but not everyone's doing digital yet." Advanced has focused most of its work on the corporate market, however, University work has started taking up more of its time, as Wildemann noted. "We're mostly corporate, but we've gotten a fair amount of university work. We do college graduations, and we just did huge Capital Campaign event for the University of Pennsylvania. We do work for Colombia, Villanova, and even a little for St. Joseph's. That's grown into about 20 percent of our business. From a corporate standpoint, we're also very heavy in FARMA. Most of the production companies we deal with have FARMA accounts they bring us in for." Production companies are a familiar entity to Advanced, as most of its business has been coming from that sector, as Wildemann said. "Most of the high end work we do now is through production companies. If anything has changed in our business model over the years it's less and less direct to the end user and more through meeting planners and production companies. I do enjoy working with them more because it gives us a buffer from the end user and allows us to concentrate on what we're good at, which is equipment and technical expertise. It's nice to collaborate with those groups, and it's best when they bring us in early, but we're not a creative agency. When you're dealing with a production company, you know that they're knowledgeable as far as the event and what it needs to be and look like, and you spend much less time educating your consumer, which you do a lot of with end users." The future seems bright for Advanced, with steady growth in just the past few years. Wildemann is looking ahead with confidence, "Our sales efforts are focused on trying to get ourselves recognized at a level that most of the bigger companies work, but with a more personalized service. We've been growing at a 20 - 35 percent rate over the last three years, so if we can continue on that path then there are good things in the future for us." For more information visit www.advancedstaging.com.